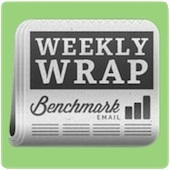 Lots of DIY on the slate for this edition of The Weekly Wrap. Lots of info on how to make it on your own in the business world. Plus, you can win a Kindle Fire! Why do birds suddenly appear? I can’t remember the rest of that Carpenters song, but Richard can answer the question, Why Do My Emails Land in the Spam Folder? I make a 40-Year-Old Virgin reference and also you can Win a Kindle Fire in Benchmark’s New DIY Series. It’s actually a mix of that, the long weekend and whatever else was going on in the world this week. Plus some things I think you should listen to. Check out Your Benchmark Email President’s Day Playlist. Probably more productive than trying to hide vitamins in girl scout cookies! Discover A Sneaky Way to Build Your List and Educate Your Customers. We have a meeting every morning with my team here to say what we did, what we have to do and any blocks we’re having. Most often, my biggest block is that there’s only so many hours in a day. That’s why it’s important to learn Priority Management, Not Time Management. AKA how to do it better than the NCAA. Learn How to Recruit A Players for Your Startup. These two keep doing so well, every time they’re on TV they get invited back: Jose Hernandez and Daniel Miller to Speak at Mundo Fox en Español. Follow along with Csaba on his stream of consciousness focusing on Living Your Dream: The Soul of a Startup. We’ve all seen it happen. Don’t let it be you. Find out How to Not Botch Your Social Media Marketing Efforts. What Are the Steps to a Robust Inbound Marketing Strategy? There can even be baby steps, for all you What About Bob? fans out there. So, What Are the Steps to a Robust Inbound Marketing Strategy?